Corrugated copper / stainless steel / SS braided. 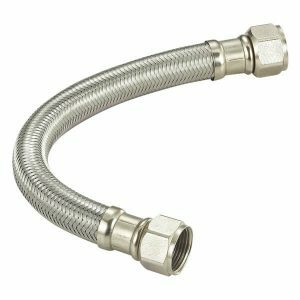 Core material is reinforced PVC hose, which is tough and strong enough to hold the possible water pressure in water line. Then stainless steel wires (normally 304) are braided at the outer layer to support and protect the core PVC hose. Most flexible, suitable for installing in small area. PVC is unstable when temperature is up to 80 ℃（176 ℉），it gets soft, and toxic material maybe spread out. Life is shorter than copper or stainless steel. Copper corrugated supply line is made from lead free copper. Flexible, but less flexible than other two. Suitable for use with hot water. Unsuitable for installing in small corners where requires extreme bending. Stainless steel corrugated supply line is made from stainless steel (mostly 304). Medium flexible, better than copper, but worse than braided PVC hose. 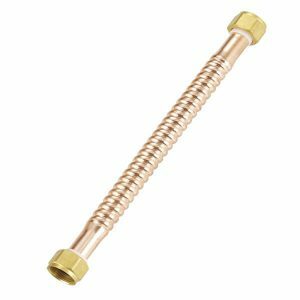 Corrugated copper supply line was pretty popular in old times, but now corrugated stainless steel supply line is most popular and mostly suggested. What you should do is to evaluate and choose the best match for your installation scenario.